People on Sunday is a fascinating historical document of late 1920s Germany, offering a glimpse into the fashion, architecture, and customs of the time. It's also notable for the key group of young German creative personnel behind the camera, especially the legendary Billy Wilder, future director of such Hollywood classics as Sunset Blvd., Sabrina, and Some Like It Hot. Fellow members of the group included noir masters Robert Siodmak, Edgar G. Ulmer and Oscar winner Fred Zinnemann. Their involvement makes the film worth seeking out for a look at their early creative process, although the final product is fairly rough around the edges even taking into consideration the limitations of the silent-film era. The title of the film is completely descriptive of the content, as it is largely a slice-of-life project with very little narrative. It sets out to show how Berlin residents spent their lazy Sundays in the country, incorporating travelogue footage of people at the beach, riding on trains, and basically finding any way to relax away from the strains of their regular work weeks. Eventually, some characters emerge, as a small group of nonprofessional actors engage in some flirtations at the beach, but they're still largely just set dressing on the overall Berlin stage. In short, the extremely limited narrative is definitely not the reason to watch the film. Instead, its most effective aspect is its ability to capture an idyllic, pastoral view of Germany, giving viewers a look at how carefree and peaceful the country was in advance of the looming Great Depression and later war. The film was restored from numerous sources compiled from throughout Europe, making for what is ultimately an approximation of what the restoration team believed to be the most complete version of the film. It also makes for varying film quality as they edited together the best possible parts of each sequence. Overall, the quality is pretty low, and realizing this Criterion apparently opted to go with 1080i presentation on the Blu-ray instead of full 1080p. Frankly, there's really no reason to upgrade to Blu-ray for image boost as DVD quality is more than adequate for the material. As for sound, Criterion has included two soundtracks for this silent movie: an era-appropriate score by the Mont Alto Orchestra as well as a more modern score by Elena Kats-Chernin, performed by the Czech Film Orchestra (both presented as uncompressed stereo soundtracks on the Blu-ray edition). I preferred the former, as its simplicity suited the material much better than the soaring orchestral scope of the latter. However, it's fun to toggle back and forth between the two sound streams whenever one wears out its welcome. The two primary extras are a half-hour long documentary filmed in 2000 about the production of the film that includes an interview with one of the original actors and writers, as well as a half-hour short film from 1931 called "Ins Blaue hinein" by People on Sunday cinematographer Eugen Schüfftan. The film has sound and has far more plot than People on Sunday, following a couple of guys and one of their girlfriends as they drive around the German countryside, bemoan their employment status, and eventually open up a pet grooming business together. It's a nice bookend to the feature film and worth checking out. 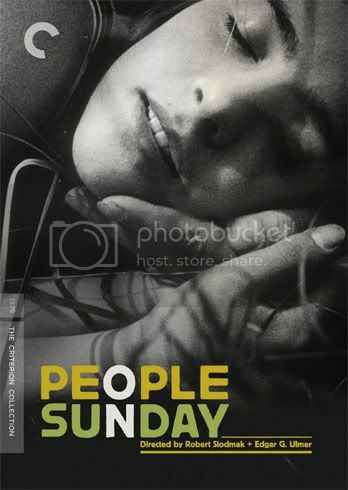 People on Sunday is now available on Criterion Blu-ray and DVD. For more information including a video clip, visit the Criterion website.